The Jarvis Model ABC-1 — hydraulic powered aitch bone cutter for hogs. Cuts hog and sow aitch bones cleanly and effortlessly. This high production tool allows a single operator tao separate the aitch bone of 1200 hogs / hour. 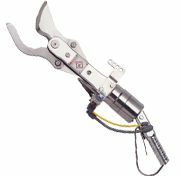 Powerful, lightweight, and maneuverable – reduces the operator fatigue associated with knife or cleaver opening of the aitch bone. Eliminates contamination created by miscuts into the large intestine. Robust stainless steel construction for long, trouble-free operation.